Well, give him some credit. He did bring Bootsy Collins on. The comical part is the beginning when he chides those unfamiliar with Bootsy Collins. 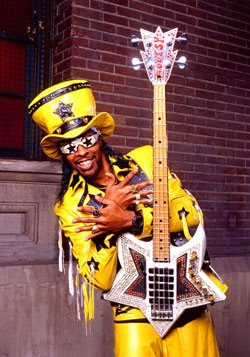 I'm wondering if he really knew who Bootsy was before Bootsy was booked for the show. And then the guy sells out by stating that he never thought Mike was guilty; he thought he was simply being shaken down. Talking about talking out of different sides of your mouth. But I especially enjoyed Bootsy explaining that he was not of this world. Hopefully, one day Bootsy and George Clinton and the rest of the P-Funk crew will do a documentary allowing us to explore the world they have emmigrated from. I would be a treat. I'm wondering if he really knew who Bootsy was before Bootsy was booked for the show. I get the feeling from this interview that Bootsy is a high-profile Cincinnati celebrity. And so is Cunningham. Guess there aren't many of those... so it figures their paths would cross. Part that tickled me was when Cunningham said, "I look normal, right?" And Bootsy was like "Uhhh... somewhat." I've seen Cunningham on Fox News, and he's one of those men who looks like a lesbian. I listen to the whole thang, Bootsy and Patti had him over for Thanksgiving last year, so he should know who Bootsy is by now. why were you ever in Cleveland? Now I'm just counting the days until the first report of an MJ sighting. Kellybelle: I love that Rock Hall of Fame. Be proud of your city! A huge second line parade was held in New Orleans to honor MJ. I think I'm going to have to turn off the Michael coverage...they're digging up everyone to basically state the obvious. People who need it explained to them why MJ matters will never get it anyway. Second line sighting for MJ in NOLA?! Cool. This was a fantastic interview. Thanks for posting UBM. Glad to have you back especially now. I'm going to have to go into MJ rehab myself. I can't get "Thriller" and "Billy Jean" out of my head. Let me see what's on the CD pile.